After finding some solid resistance at 800¢ earlier in August, it looked like lambs stellar run was finished. This week the market came back to life, with new highs set in heavy and trade lamb markets. Figure 1 shows the Eastern States Trade Lamb Indicator (ESTLI) posting a 52¢ rally to hit a new record high of 813¢/kg cwt. With the ESTLI sitting a massive 219¢, or 36% above the same time last year grower who can supply finished lambs are being very well rewarded. 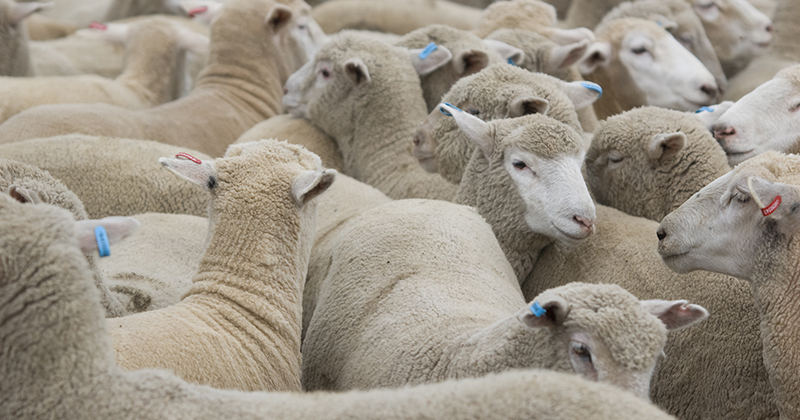 Trade lambs have broken through 800¢, but heavy lambs are remarkably closing on 900¢. The eastern Heavy Lamb Indicator is just shy of 300¢ higher than last year, at a crazy 876¢/kg cwt. It’s no surprise that Wagga set a new record this week, with a pen of lambs selling for $305 per head. This week’s price rally was due to further tightening in supply. Figure 2 show east coast lamb slaughter hitting a two year low for a full week, slipping under 300,000 head. We can see in figure 2 that lamb slaughter usually starts to ramp up this time of year. The dry weather is playing havoc with normal seasonal trends. Despite, or perhaps because of, the better seasonal conditions in the West, the WA Trade Lamb price lost 29¢ to sit 663¢/kg. Still a great price, but just 150¢ behind east coast values. Mutton prices continue to languish as heavy supplies of sheep come to the market. It’s good to see ‘drought’ sheep prices at 430¢/kg cwt. It’s not that long ago that sheep were making less than $4 per head during drought. The Bureau of Meteorology (BOM) yesterday released their 3 month outlook (figure 3). Again it’s a bit depressing, but it’s now forecasting dry weather for the southern areas which are currently experiencing normal seasons. A dry spring in key southern lamb areas would be likely to add to the supply of store lambs, and continue to limit the supply of finished lambs. If it is indeed dry, hopefully some rain in NSW might offset some of the supply issues.